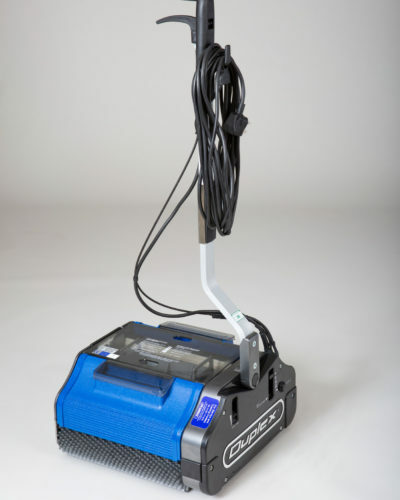 The Duplex 340 110v Floor Cleaning Machine is designed for use around swimming pools or in wet areas where the standard 240v supply would not be appropriate. 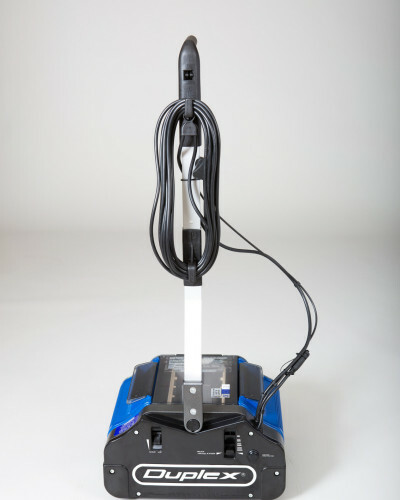 Supplied with 110v motor, cable and plug, the twin contra-rotating brush floor cleaning machine has thousands of bristles placed diagonally across the width of each brush to ensure a really thorough clean. The Duplex 340 110v Floor Cleaning Machine is suitable for all flooring surfaces, effective on hard floors, carpets, sports safety flooring, and entrance matting, tiles, marble, wooden floors, non-slip resin floors, Marley, Tarkett, Polysafe, Timbersafe, Flotex and Altro . 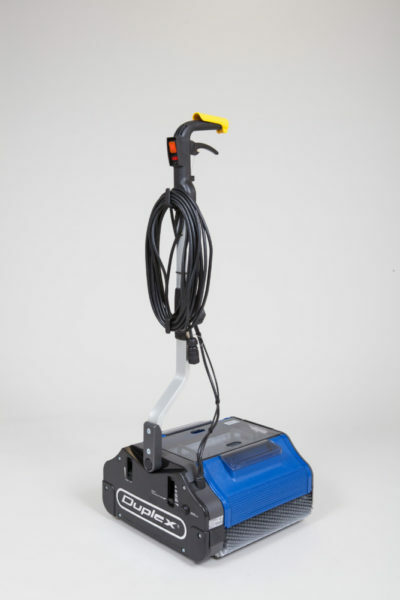 It has a cleaning width of 340 mm (13″) and this compact but powerful machine cleans, scrubs and with the simple flick of a switch picks up the dirty water and grime leaving floors clean and dry in almost no time at all. The brushes of the Duplex 340 110v are offset to one side and rotate at 600 rpm. This allows ‘right to the edge’ cleaning, alongside walls and into corners, along skirtings, under furniture and all those hard to reach places. 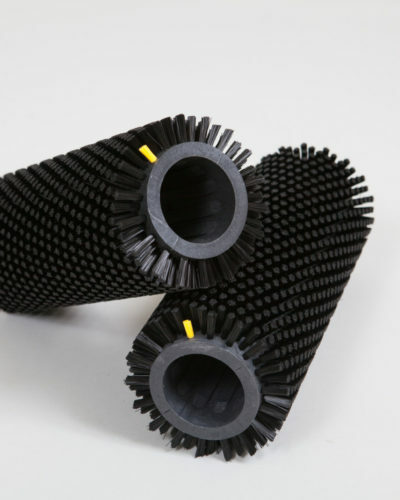 A range of easily interchangeable brushes are available to suit any particular floor surface from carpets to hard floors. 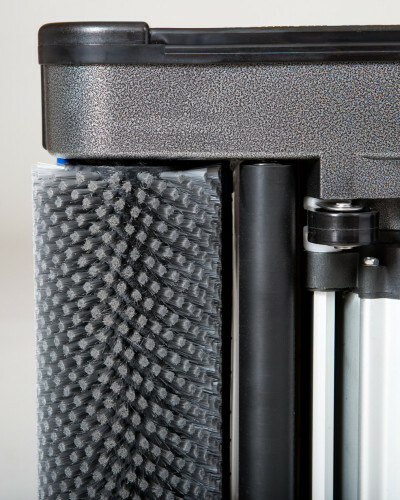 The machine has a bi-directional handle so it cleans in both directions without the need for any heavy lifting or turning. Whatever the size of floor, Duplex Floor Cleaning Machines has a model to suit and the Duplex 340 110v is perfect for those mid-range sized areas-small enough to get into tight spaces but big enough to make light work of the task at hand. Duplex offers free on-site, no obligation demonstrations throughout the country by our own highly trained and experienced sales team. If you buy a Duplex Floor Cleaning Machine you will also benefit from on-site certificated training and installation. Duplex Cleaning Machines offers planned servicing with Preventative Maintenance Agreements available throughout the country by our team of trained and helpful service engineers to help you get the best out of your Duplex machine and extend its working life. If you have the type of facility which requires 110v supply why not book a demonstration of the Duplex 340 110v Floor Cleaning Machine today.